In the beginning of the new year it's customary to sum up the previous year and also make forecasts, guess trends of the upcoming year. We've try to imagine what we are for in 2006, which models will come out, which trends will be most clear and bright. We'll build our forecast on the facts. The accuracy of it doesn't depend on the author's insight, but on how the companies will complete their plans for 2006, marked in their documents as "confidential". The nature of our occupation makes us be in the know of the facts, announcements and company's plans for the next year. We use the gathered info to prepare some analytical reports and usually do not publish it, so why have we decided to publish such material this time? In the second half of 2005 there emerged plenty of "secret" info on companies' plans by way of rumors and unverified data, it had been exaggerated and reprinted many times by electronic and then print mass media sources. In some cases the leaders of the companies were too open to the press. Many things we discuss today had been already published. Our task is rather to systematize the info, whether to support it or contradict. In result we'll come to some conclusions. We are not to unveil all the plans by the companies, we don't mean to affect the current sales, by publishing full specifications and photos (this won't happen, I'd repeat, many things have already been voiced). Well, we'll just slightly unveil the curtain. Inspired by the success of Sony PSP some players will try to enter the market of portable game consoles with Windows devices. These attempts will fail as in case with Tapwave Zodiac with Palm OS. By the end of 2006 the sales of the PSP only will exceed annual sales of all PDA twice as much at least. As we see the picture is far from being rosy. Like anything related to the future any of the points can get changed, happen with higher or less probability, but we think these events are most likely. We've done with PDA and let's pass over to communicators and smartphones. Plans are just plans, the reality makes its corrections. The companies delay the release of several models or even cancel them for some reasons. Let's see which models had been cancelled. 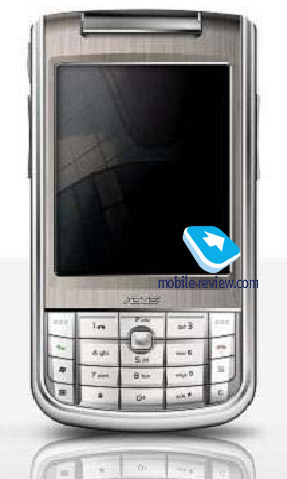 Asus P515 slider based on Windows Mobile 5.0 should have come out late in 2005, but the delay of Asus P505 and the preparation of new models forced the company to cancel this device. As far as the model is cancelled we decided to publish its photo. 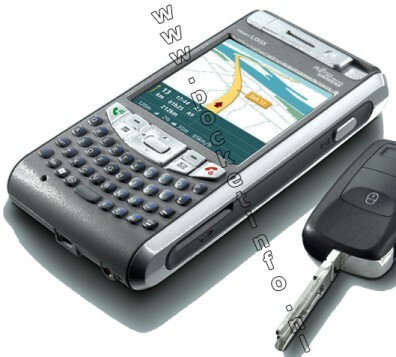 In functionality it is similar to Samsung i750 communicator. It wasn't announced. The HTC model under the code name Blizzard should have also appeared in late 2005, but it was cancelled. It should have offered a combination of the smartphone without the touchscreen and the communicator with the touchscreen (the touchscreen plus the ordinary digital keyboard). The model wasn't announced. The long-awaited announced Moto Q smartphone was cancelled in the end of 2005, as well as the number of Motorola handsets. The model will keep on roaming from one exhibition to another, but it won't get to the shops, exactly the same story was with Motorola MPx. According to IDC in 2004 the share of Symbian OS in communicator and smartphone sales (converged device - the company's terminology) made up 55.9% and Windows Mobile - 12.7%. The company predicts that Symbian share will grow to 60% by 2009, and Windows Mobile - to 17.3%. In near future there will be no sense in differing the terms of the smartphone and the communicator. Given the operating systems the distinctions will be erased. At the Mobius 2005 conference Microsoft officially confirmed that the next Windows Mobile version (the code name Photon) will eventually unite both branches: Windows Mobile for Pocket PC and Windows Mobile for Smartphone. There will be a single operating system instead of two. The main works to merge both branches were held in Windows Mobile 5.0. The similar erasing of borders between communicators and smartphones will be inside the Symbian platform. The company blabbed out not intending to. We can read the following at the official FAQ at S60.com site, "Nokia has produced two other platforms, the Series 40 Platform and the Series 80 Platform, and it has a device, the Nokia 7710 widescreen smartphone, that is based on Symbian OS. <…> Note that features of the Nokia 7710 smartphone will be fully integrated into the S60 platform in 2006". You shouldn't be wise to understand it deals with the merger of two platforms, the support of touchscreen in the S60 platform. We'll see devices based on new OS not earlier than 2007. Alas, we won't wait till the implementation of Linux in smartphones, which could have been the standard, the fact will contain much the development of this operating system. Now let's pass over to the vendors. The market of Symbian-based devices tends ever to monopolization. Nokia fortifies its positions, Sony Ericsson keeps the stability. Panasonic announced it closed the GSM-phone direction as well as the smartphone direction, BenQ-Siemens turned down Symbian. There are just two nominal rivals left - Samsung and Lenovo, which can't make a strong competition to Nokia. The Finnish company stays the price and technology leader. Nokia. The lion's share of smartphone sales falls on Nokia's S60 platform. We can say that the Symbian destiny is in hands of Nokia. In 2006 the number of new S60 models by Nokia will double (8 models have been already announced, which will be commercially available in 2006). We won't speak about the models announced and much discussed, let's see what is to expect in 2006. All new products will be based mainly on the S60 3d edition platform. Several models, for example, the budget Nokia 2250 will be based on the old S60 version. Old programs are incompatible with the new S60, they need to be recompiled and signed. About half a year will pass, till we have a necessary set of programs for the new operating system. The Bluetooth and Wi-Fi pair will become the standard as the miniSD memory standard. This is the clamshell with 3-megapixel camera (3x optical zoom - for the first time) and a large screen. The model is in a classical shell with the functionality of Nokia N80. In various combinations we'll see such functions as HDD, large internal flash-memory, mobile digital DVB-H, satellite GPS navigation. There won't be a Nokia model that would absorb all these functions. In the second half of the year Nokia will step over the 3-megapixel line. The company will keep on experimenting with the form-factor. By closing the development of the Series 80 platform Nokia faced a temporally vacuum, when the life cycle of Nokia 7710 is approaching to the end and it's still far till the touchscreen in the S60 platform. 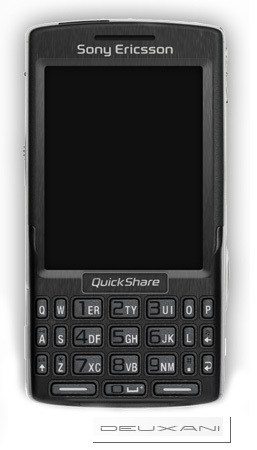 In part it is replaced by Nokia 770, but this is the PDA, not the communicator. 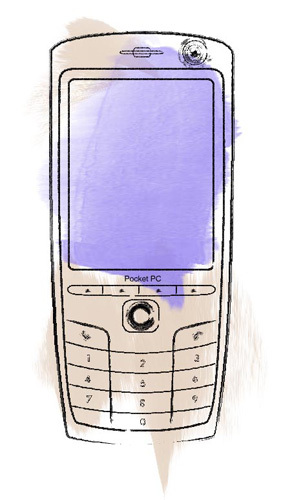 The company redeemed BenQ P31, a UIQ communicator, from BenQ and called it Nokia 6708. Thus the company hit 3 goals: the model filled the vacuum, there appeared a direct rival to Sony Ericsson communicators, money wasn't spent on the development. Sony Ericsson. In addition to the already announced Sony Ericsson P990 (the review is here) the company is preparing a simplified version with the keyboard similar to some BlackBerry models. The device will have smaller size and there won't be a camera. The models will emerge on the market with a short time gap. A fundamentally new device is to appear only in 2007. Nokia is the unconditional leader in the Symbian-segment, Sony Ericsson is staying apart. Other companies are following with at least a year's technological gap and a limited model line. The year of 2006 won't break this alignment of forces, it'll only strengthen Nokia's positions. This operating system is trying to win its share of the market. If in the Symbian-segment we'll clearly see the monopolization, the Windows Mobile segment in 2006 will show us a burst of the number of manufacturers (we mean manufacturers and not trademarks). Until this year the big share of new smartphones and communicators was recorded by the Taiwanese company High tech Computer (HTC). In 2006 this trend will be broken for the first time, the company will get strong rivals, but keep its leadership in sales volume and the number of new models. It's hard to believe, at least 16 vendors (mainly Taiwanese companies) will fight their place under the sun. And there will be ever more trademarks for the devices. HTC. Last year the company's plans were published in the Internet (specs, photos), so we can talk about them in details. In all, the company expects to release 6 communicators and 2 smartphones in 2006. 4 of them support UMTS and another 4 - GSM/EDGE. The majority of new devices (except for modifications of old models) will be switched to microSD memory standard. HTC Wizard - the model with the side sliding keyboard. It had been developed in two directions. Firstly, we have a UMTS version, HTC Hermes, the models are similar in design and functionality. Secondly, HTC Herald is set for the end of the year, it's the same HTC Wizard but in thin shell (18 mm thin), with less capacious battery and microSD memory standard. The keyboard-less HTC Magician has got the successor HTC Prophet (the European premier has been suspended till March, read the review here), not everybody welcomed the model enthusiastically. HTC Magician will be really continued in 3Q 2006. This will be HTC Trinity based on Intel processor, built-in Wi-Fi and Bluetooth, A-GPS and HSDPA support. The design has been inherited from HTC Prophet. A fundamentally new model, HTC Muse , will come out in the mid of the year. It has been obviously created under the iPod popularity. It has a square (2.4") LCD, there is enough space for the digital keyboard, but instead we see a big navigation and soft keys (that makes it closer to the iPod design). I'd note 4GB of built-in flash-memory, an FM-radio, a remote control, a TV-out. We see the device is first of all oriented at the opportunity to listen to the music and watch video, including on a big screen. The weak points are the square LCD and the lack of Wi-Fi, in the rest the model is interesting. Another new direction is with the navigation model HTC Artimes. It lacks Wi-Fi and UMTS, however it attracts attention with a GPS-receiver, a digital compass and a scrolling wheel instead of the navigation button (like in Samsung i300). The release date is set for the mid of the year. At last we see a clamshell among HTC smartphones (HTC Star Track). There will be also a UMTS-smartphone (HTC Breeze). Both models will be slim. The release date - the end of 2Q-the beginning of 3Q. What won't we see by HTC? Independently of Motorola the company has started developing a slim smartphone with the QWERTY-keyboard and landscape screen orientation. The model has got the code name HTC Excalibur. Should we mention that it was very like as Moto Q. Following the Motorola announcement HTC decided to cancel its model. Besides we won't see the successor of HTC Universal. The heir of HTC Universal will come out only in 2007. Now let's mention the companies, which will release HTC products under their brands. HP (HTC production). The company took the course on communicators instead of PDA. 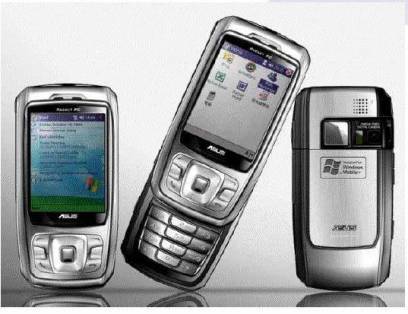 It plans to release 4 new models in 2006 - 3 communicators and 1 smartphone. In the beginning of the year HP will introduce HP iPaq hw6900, an update of HP iPaq hw6515 (the review is available here) with Wi-Fi and one slot for expansion, Windows Mobile 5.0. By the end of the year the company will unveil two more communicators. One of them will be a slightly changed HP iPaq hw6900, the other will have a sliding keyboard like HTC Wizard. Besides the company will release HTC Tornado smartphone in slightly different design under its brand (the review is available here). Fujitsu Siemens (HTC production). In the middle of the year the company expects to release its 3G communicator with the QWERTY-keyboard and the square LCD (like Palm Treo 700w and HP iPaq hw6xxx), it will also have built-in GPS. There will be both Bluetooth and Wi-Fi. The model will get the index FS Pocket LOOX T810/T830 (the modifications differ in the camera availability). It will be announced in 1Q and offered for sale in the end of 2Q. Palm (HTC production). On early dates of the new year there has appeared the first Palm model powered by Windows Mobile OS - Palm Treo 700W communicator. According to the company the demand suppressed all expectations. The leaders of Palm turned to speak much surprisingly and unveiled their plans for the year (after a shareholder of Palm had published the info): in 2006 there will be 4 new communicators. 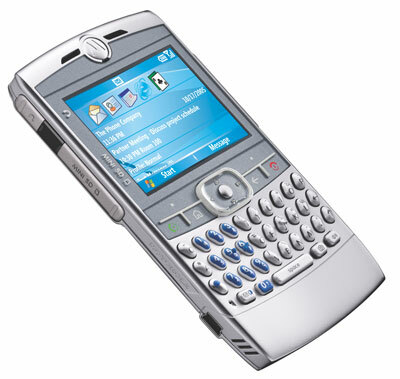 During 6 months the Treo 700w will be exclusively manufactured for Verizon CDMA-network, and only then we see a GSM-version for the rest of the world (summer 2006). 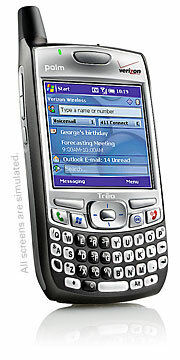 Palm Treo 700p is the same 700w, but with Palm OS Garnet and a higher quality LCD. It will be an exclusive for the US network Sprint for some period. The model under the code name Hollywood is the top of the line with the support of 3G-networks and the absence of the external antenna. It will be introduced in 2Q. And finally the last model - the budget Lowrider, the approximate price is $300. Well, we've finished with HTC products. Asus. The company has impressive plans - the release of 2 smartphones and 3 communicators. In April the company will demonstrate its communicator under the code name Galaxy (see the photo above). It features an ordinary digital keyboard and needless to say Bluetooth and Wi-Fi, a 2-megapixel auto focus camera. In 3Q there will be the announcement of the model called Mars standing out for 3G support. And later we will see Mars II, which will have a side sliding keyboard like HTC Wizard. Asus P305 smartphone will be announced in April (a dull 3G-clamshell), it will be replaced by the Scorpio model in the end of the year, it will differ in a better camera and built-in GPS, the miniSD slot will be replaced with the microSD slot. It's hard to believe that Asus will complete its plans, most likely we'll see 2 models on the market. Samsung. This Korean company will offer 4 new GSM-devises based on Windows Mobile. They are Samsung i300x with higher capacity disk and new OS, Samsung i400 with 10 GB HDD, Samsung d300 smartphone, a slim slider with the functions of Samsung i750, new OS and a 3-megapixel camera. Kinpo. It's a relatively young player on the market. There is just one announced model - Kinpo S600 (known under Qool trademark). In future it will get Wi-Fi and WM 5.0 operating system. In 2006 the company plans to release 7 (!) communicators, gradually upgrading the functionality of the initial model and using slider and side slider form-factors. One of the models will be with built-in GPS. I'd note the "planet" code names of the products, for example, Jupiter, Titan, Mercury. Most likely we'll see maximum 2-3 models by Kinpo in 2006. GIGABYTE. A new and ambitious manufacturer has already managed to stand out with its unique slider GIGABYTE g-Smart (a built-in analog TV-receiver, for the first time). The company plans to release 6-8 new communicators in 2006 (with such functions as GPS, digital TV DVB-H, extended multimedia opportunities like in HTC Muse). We've told you about the most interesting models. We'd also note the Acer communicator expected in the middle of the year, the return of MiTAC and the market entry of Tatung (however, with one model). There will be kept the trend to unify smartphones and communicators, branches of one operating system will be merging. Business card recognition will become the standard utility.